The studio is up and running and I have started a couple of new pieces. It feels weird to have so much space after my tiny old studio. The open house will take place on March 6th & 7th- 10:30 to 4:30 each day. Everyone is welcome to drop in if you are in the area. Alan will open his studio to visitors too. We're home from Mexico for 2 weeks now and we hit the ground running. I've been painting floors, doors and woodwork for too long- very anxious to get painting on an easel again. I plan an open house weekend so the local friends can come and see the new studio but I want to do at least one new painting in the new digs before that. Once I will have a date I will let everyone know- all will be welcome. 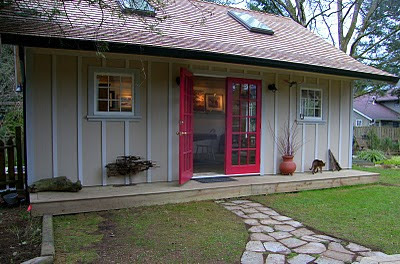 We still have to paint the exterior of the studio but that will wait for warmer weather. I also need to build a paved walkway from the house to the studio doors before I end up with a mud path. I was going to work on that today but it's raining. Maybe a good day to start that new painting!